Dr. Ashwin Saboo is a UK trained Specialist in Neonatal Medicine. He received his medical degree (MBBS) from Topiwala National Medical College, Mumbai, India in 2004 and obtained his postgraduate degree (MD) in Paediatrics in year 2010 from the prestigious Post Graduate Institute of Medical Education and Research (PGIMER), Chandigarh, India. He then, completed his Neonatology Fellowship from University Hospital Southampton, NHS Foundation Trust, UK in 2014 followed by Neonatology Bridging Program from Corniche Hospital, Abu Dhabi in 2016. Prior to moving to the NMC Royal Women’s Hospital, he was a specialist Neonatologist at Corniche Hospital, Abu Dhabi. He started his career as Medical Intern from Topiwala National Medical College, Mumbai and then worked with various prestigious institutions. 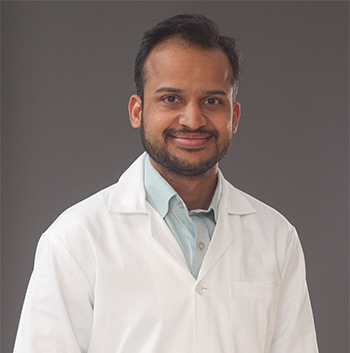 He gained excellent experience in teaching and education through his role as an Assistant Professor for Paediatric postgraduate medical students in Topiwala National Medical College and BYL Nair Hospital, Mumbai. He is also a Paediatrics Contributing Author for Rankjunction.com - an exam platform website for medical students, since 2011. He has more than 20 scientific publications to his credit and is currently pursuing research on "Epidemiological and causative analysis of UVC extravasation data from 2011-14 in tertiary care Neonatal unit in South England". Dr. Ashwin likes to keep himself abreast with the current practices and has completed various training programs such as Structured Simulation sessions on Neonatal Ethics, Neonatal Vascular Access, Neonatal Airway management, Communication skills; Neonatal Resuscitation Program (NRP), Neonatal Cranial Ultrasonography Course, Neonatal Life support (NLS) and Basic Life Support & Automated External Defibrillator to name a few. Dr. Ashwin has not only attended but also presented talks at various international conferences. His Neonatal Simulation-based Education project (MPROvE) at the University Hospitals Southampton, NHS, was nominated for BMJ 2014 award (UK's premier medical awards), in the Best Education Team category. During his spare time, he loves to read and write about health promotion and preventive care on various social media platforms.